"The veterinary nurse that I would like to nominate for the Irish Veterinary Nurse Awards for 2015 is Kirsten Cole. Kirsten works at the Cara Veterinary Hospital, Ballycoolin, Dublin 15. What makes Kirsten special and an excellent candidate for this award is not only the exceptional level of expertise she shows when it comes to the care of any animal in her care but it’s the fact that she does it in a manner that automatically puts you and your pet at ease. My beautiful dog Benjy took ill in August 2012 and after weeks of highs and lows and the excellent care of the staff of Cara Veterinary Hospital. My beautiful boy was diagnosed with pancreatitis and liver tumour. It broke my heart. However, I have to say with the help of the staff and in particular Tracey (Vet) and Kirsten who always greeted us with a smile and a cuddle for Benjy our regular visit were not as painful or upsetting as they could have been. With their help my beautiful boy lasted for another 2 years until the day came for our goodbyes. As I went to the Hospital that day, with the help of Tracey and Kirsten they made one of the toughest tasks I had to make a little more bearable. Their help and understanding was just outstanding and something I will always treasure and never ever forget. Behind Kirsten’s happy relaxed exterior there is also a very intelligent, well trained, level headed veterinary nurse that knows what to do. Kirsten is such a lovely, happy and bubbly person who just adores every animal in her care and the word “Thank you” just never seems to be enough. This is now my chance to tell Kirsten how eternally grateful I am for all her help in the lowest points of my poor Benjy illness and also for the great memories we made with her and the staff. I feel privileged to have had her as a veterinary nurse looking after my Benjy, and really hope she wins the award and she truly deserves it." 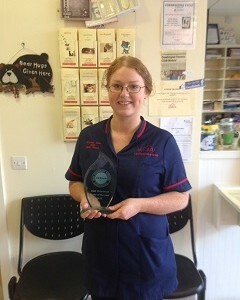 Sydney Nagle, principal of Cara Vets said 'this award recognises inspirational nurses who excel in delivering safe, quality patient care. It celebrates people who do extraordinary things and it inspires a new generation of young Veterinary Nurses to dedicate themselves to the most privileged profession of nursing'. 'We are all so proud of Kirsten and this achievement. It is a real honour and so well deserved. I am honoured to have such amazing people to work with in Cara Vets, but it is the icing on the cake for us to see Kirsten get such recognition from our clients for compassion and care'.